Marseille was designated European Capital of Culture for 2013. So what does that mean? For tourism, it means extensive investments in infrastructure and restoration, resulting in refurbished museums and public spaces, making the city more hospitable to visitors. The area of the Vieux Port has been transformed to make it more pedestrian friendly, while a number of museums have been renovated. 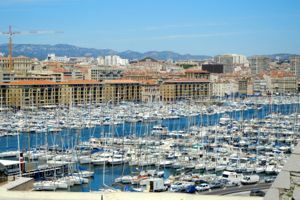 It also means a variety of special cultural events, in Marseille and in some of the surrounding towns of Provence. Concerts, exhibitions, and other special events fill the year, in celebration of the Capital of Culture. The term was coined by Melina Mercouri and Jack Lang in 1985, and Athens was the first Capital of Culture. Each year one or more cities/regions receives the title of European Capital of Culture, based on proposals submitted. The aim is to develop high-quality artistic programs and make them accessible to wide audiences. Programs may range from art and culture to theater and dance, to science and technology. Above, The Vieux Port of Marseille, as seen from the Saint-Nicolas Fort.